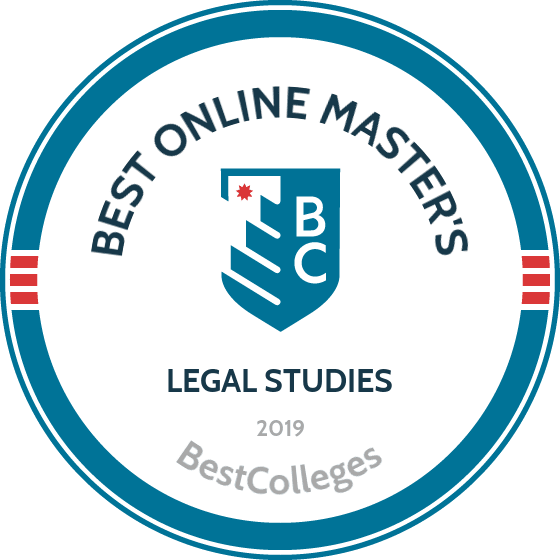 WHAT ARE THE BEST ONLINE MASTER'S IN LEGAL STUDIES PROGRAMS? What Else Can I Expect From an Online Master's in Legal Studies Program? A master of legal studies online degree provides a thorough understanding of the U.S. legal system, but it’s not intended for students who plan on taking the bar and becoming attorneys. Instead, a master’s in legal studies serves learners who desire a better understanding of the law in order to work in the court system or assume positions related to reporting, education, business, or law enforcement. According to the Bureau of Labor Statistics (BLS), people in jobs related to this field, including paralegals, court reporters, and arbitrators, earn above-average salaries. The BLS also projects that as many as 116,200 new jobs will be created in the field between 2016 and 2026, which equates to a growth rate that is slightly higher than the national average for all jobs. Most online master’s in legal studies programs do not require any previous work experience. Standardized tests like the LSAT and GRE are also not typically required. Generally, all you need is a bachelor’s degree and an interest in law. The best online master’s degrees in legal studies fit your schedule and prepare you for your desired career. To figure out what you need from a program, ask yourself a few questions: Do you want a part-time program? What size school would you prefer? Have you already decided on a career path? Some schools only offer full-time programs, and your target career might require a specific, less common certification. WHAT ARE THE ADVANTAGES TO EARNING MY LEGAL STUDIES DEGREE ONLINE? Many students who want to earn a master’s in legal studies work full time, and an online education represents a flexible way to earn an advanced degree while maintaining their employment. Most programs feature part-time options to fit busy work schedules. Additionally, many schools offer self-paced learning, which can drastically reduce the amount of time it takes to earn a degree. Founded in 1853, Washington University provides undergraduate, graduate, and professional programs from six locations in the greater St. Louis area. It enrolls more than 15,000 students in over 90 fields of study and boasts an 8-to-1 student-to-faculty ratio. The master of legal studies online, offered through the School of Law, benefits corporate, education, insurance, and real estate professionals by covering topics in legal procedures, risk management, and government regulations. Paralegals, lobbyists, and individuals working within legal and regulatory settings gain legal expertise to advance their careers. Washington University’s online master of legal studies curriculum includes 24 credit hours that learners complete in one year. Coursework includes one required class in the foundations of law and seven electives in subjects such as civil procedure, trial advocacy, and constitutional law. Students complete classes geared toward their interests and goals as they learn to draft legal documents and conduct legal research. Through discussions, debates, and online assignments, students analyze laws and regulations as they apply to contemporary business and ethical issues. Applicants to the online legal studies master’s degree must submit a statement of purpose, resume, and official transcripts. They also participate in an online interview. The program offers four start dates each year with applications accepted on a rolling basis. Washington University holds accreditation through the Higher Learning Commission and the master of legal studies program obtained approval from the American Bar Association. From its Webster Groves campus in St. Louis, Webster offers undergraduate and graduate programs through five schools and colleges. Founded as one of the first Catholic women’s colleges west of the Mississippi River, Webster emphasizes global learning components in all of its educational programs. The online master of arts in legal studies builds an understanding of the American legal system. Students study how laws, regulations, and judiciaries relate to businesses, communities, and individuals. Learners develop critical thinking and analytical skills applicable to careers that require legal expertise. Students explore legal reasoning and analysis, professional codes of conduct, theoretical and practical applications of legal principles, and legal communication practices. The 39-credit online master’s in legal studies includes classes in jurisprudence, methods of legal research and writing, civil actions, and Anglo-American legal history. Additional courses include ethics for the legal profession, computerized legal research, and American constitutional law. Students finish the degree with a research and writing project. To apply to Webster’s online legal studies master’s degree, students need a bachelor’s degree from an accredited institution with a minimum 2.5 GPA. Applicants submit transcripts, a letter of recommendation, and an essay. Based in the capital city of Illinois, UIS joined the University of Illinois System in 1995. Accredited by the Higher Learning Commission, UIS provides undergraduate and graduate programs to almost 5,000 students, including more than 1,000 online learners. UIS offers a master of arts in legal studies that offers students a comprehensive understanding of the American legal system. The 36-credit online master’s in legal studies builds practical legal knowledge for professionals who interact with laws and legal processes. Business professionals, investigators, international lawyers, and compliance experts gain insight into judicial processes, legal theory, and how law intersects with social and cultural change. Classes in public advocacy, theories of justice, and politics and law precede four hours of clinical education coursework. Students participate in an internship with a legal aid office, private law firm, public interest group, or administrative agency to apply degree knowledge. Elective classes in human rights, social justice, criminal justice, and public policy allow students to tailor the program to their interests. The program also includes a thesis requirement for all students. The online master’s in legal studies includes synchronous and asynchronous classes with real-time and recorded lectures. Applicants need a minimum 3.0 undergraduate GPA and they must submit a personal statement. Founded in 1890, OU provides educational programs from three locations in Oklahoma, including its main campus in Norman. The College of Law, established in 1909, is the only public law school in Oklahoma. OU Law’s more than 800 students complete graduate, professional, and dual-degree programs on campus and online. The online master of legal studies degree provides advanced knowledge to working professionals seeking legal training. The master of legal studies online includes four specializations, including oil, gas, and energy law; indigenous peoples law; healthcare law; and international business law. Students can complete the 32-33-credit program in 15 months. Core coursework for all concentrations emphasizes the foundations of law and legal systems. Students in the oil, gas, and energy law concentration focus on legal drafting, environmental law, contracts, and regulatory practices, while learners in the indigenous peoples program explore tribal courts, Native American gaming regulations, and religion and culture as it relates to Native American law. The oil, gas, and energy law specialization requires students to complete a one-week residency in Norman. The healthcare law specialization offers coursework on the American healthcare system alongside classes in quality control, healthcare enterprises, coding and billing, and health insurance regulatory practices. The international business law program incorporates coursework on corporate law, international trade and payment systems, and international corporate responsibility regulations. Prospective students need a bachelor’s degree from an accredited institution. Applicants submit a resume, personal statement, optional letter of recommendation, and official transcripts. Based in Malibu, Pepperdine provides educational programs from six campuses and centers in California and abroad. Pepperdine’s five academic schools offer 73 degrees and boast a 12.5-to-1 student-to-faculty ratio. Offered through Pepperdine School of Law, the online master of legal studies program includes 20 credits of core courses and 10 elective classes. Core classes include legal writing, contracts, and regulatory compliance. Elective coursework allows students to focus their studies on healthcare, intellectual property, business organization, or education law. Students can also specialize in dispute resolution, focusing on arbitration and conflict mediation while developing negotiation skills applicable to the legal, business, and government sectors. Legal studies students complete two residencies over two weekends during the program. During residencies, students participate in role playing, critical discussion, and mock trial activities to solve legal problems. Residencies also include lectures from legal experts on current issues and interactions within the legal system. Learners typically graduate in 16-28 months. Pepperdine accepts students on a rolling basis with three start dates each year. Applicants need a bachelor’s degree and must submit official transcripts, a letter of recommendation, statement of purpose, and resume. Applicants also participate in a video interview. Founded in 1891 in Philadelphia, Drexel’s 15 colleges and schools offer more than 200 degrees. The school’s namesake, Anthony J. Drexel, opened the school with a vision to provide private, nonsectarian, coeducational higher education programs. Drexel’s current mission remains consistent with these ideals, incorporating cooperative learning options and research excellence into its undergraduate, graduate, and professional programs. Drexel’s online master of legal studies program includes eight specializations: criminal law, cybersecurity and information privacy compliance, entrepreneurship and law, financial regulatory compliance, healthcare compliance, higher education compliance, human resource compliance, and NCAA compliance and sports law. Core classes develop foundational knowledge of ethics and professional standards, legal research and analysis, risk assessment and management, and compliance. Learners complete specialized coursework that aligns with their interests and goals. All degrees include 30 credits, including a capstone. The capstone requires students to present a research project, literature review, or experimental study. Applicants submit official transcripts, two letters of recommendation, an essay, and a resume. All students must hold a bachelor’s degree from a regionally accredited institution. Drexel maintains accreditation through the Middle States Commission on Higher Education. Drexel’s master of legal studies in healthcare compliance holds accreditation through the Compliance Certification Board. Nearly 27,000 students attend WVU on campus in Morganton and online. The master of legal studies online degree offers three concentrations: healthcare, the justice system, and homeland security. Students complete 21 required credits and nine credit hours of electives. Learners typically complete the 30-credit degree in 18 months. Core classes in law and the legal system, legal research, dispute resolution, and administrative ethics prepare students to take advanced classes in their specialization. The healthcare focus emphasizes healthcare law, long-term care regulation, and elder law through coursework that covers state and federal regulations. Ideal for law enforcement professionals seeking to advance their career, justice system classes explore criminal law, judicial legal processes, and punishments and corrections. The homeland security concentration, tailored to emergency response, law enforcement, transportation, and immigration professionals, provides information on immigration law, military justice, and homeland security practices. All students complete a research capstone. Applicants to the master of legal studies online program need a bachelor’s degree with a minimum 2.75 GPA. Applicants submit two letters of reference, a resume, a personal statement, and official transcripts. Based in Laredo, TAMIU became a member of the Texas A&M University System in 1989. The school's five academic colleges serve 7,500 students on campus and online. Accredited by the Southern Association of Colleges and Schools, TAMIU offers an online master of science in criminal justice with a legal studies focus. The curriculum incorporates theoretical and practical knowledge of the criminal justice system for professionals in public and government sectors, law enforcement and corrections, and adult and juvenile rehabilitation settings. The master’s in criminal justice includes 36 credit hours that students can complete in one year. Students study criminology theory and justice administration with a focus on corrections, ethics, and legal studies. Core classes include foundations of the criminal justice system, law and criminal justice, and criminological theory. Elective courses include comparative criminal justice systems, cybercrime, and quantitative methods in criminal justice. Learners complete a capstone project by conducting an in-depth analysis of a topic relevant to their professional goals. TAMIU offers six start dates each year to students pursuing the online criminal justice degree. Applicants need a bachelor's degree and must submit transcripts and a resume. Learners with a minimum 2.8 undergraduate GPA or 2.5 GPA with at least three years of relevant professional experience receive automatic admission. A Christian-affiliated school located on 70 acres in Virginia Beach, Regent’s seven schools and two colleges provide undergraduate, graduate, and professional programs to approximately 10,500 learners annually. The online master of arts in law with an emphasis on general legal studies introduces students to foundational legal theories, principles, and practices. Through case studies, research projects, and interactive activities, students gain insights into legal theories, policies, and best practices. Students learn how to evaluate legal issues, communicate about law and the legal system, analyze philosophical and theological texts, and assess power structures in government sectors. Students complete 30 credits of classes in legal thought, contract law, the American legal system and writing, and criminal law. Business professionals gain expertise in laws related to corporate and company formation, structures, rights, and liabilities. Learners with a background in real estate benefit from coursework on property law and policy. Government professionals benefit from classes that examine the Constitution, federal and state governments, and local legal and regulatory practices. Individuals who work with contracts and legal documents build advanced competencies in performance and termination laws and regulations. Admission to Regent’s online master’s in law program requires a bachelor’s degree and official transcripts. Applicants submit a professional resume, admissions questionnaire, and proof of identification. Since UA graduated its first class of two women and one male in 1895, the institution has grown to almost 45,000 learners. Based in Tucson, UA offers more than 370 undergraduate, graduate, and professional programs on campus and online, including an online master of legal studies degree. Offered through the James E. Rogers College of Law, the 30-credit master’s of legal studies online includes 11 concentration options. All students complete core classes in legal procedure; American common law systems; American public law; and legal analysis, writing, and research. Learners can specialize in general legal studies, compliance and legal risk management, international economic law and policy, intellectual property, indigenous peoples law and policy, or human rights. Additional concentrations include mining law and policy, environmental law and policy, tax law and policy, criminal law and policy, and family and juvenile law. Students can complete the online master of legal studies program in one year. Asynchronous coursework, flat-fee tuition, and no on-campus requirements allow learners to complete coursework at their own pace. Applicants submit a personal statement, official transcripts, two letters of recommendation, and a resume. Many online master’s in legal studies programs offer concentrations within the broader umbrella of legal studies. The study of law encompasses a variety of subjects, from intellectual property to criminal justice, so students in this major often choose to specialize in a specific area. Concentration options vary by university and program. The criminal justice concentration serves members of the law enforcement community, providing the tools they need for career advancement. Courses like fact investigation and law and the use of force help officers understand the legal system, allowing them to anticipate evidentiary needs and better prepare for court appearances. Careers this concentration prepares for: The criminal justice concentration is ideal for students interested in law enforcement careers. Environment and natural resource law explores issues in conservation and development. Students take courses like land-use controls, climate change, and environmental law to gain a better understanding of the intersection between the legal system and nature. Careers this concentration prepares for: This specialization best serves students pursuing careers related to conservation law, outdoor organizations, and business compliance. The complex business of personnel management covers topics in finance, healthcare, insurance, and union contracts. An online MLS in HR prepares students for the regulatory framework that governs hiring, firing, promotions, training, and oversight of employees. Careers this concentration prepares for: This option suits anyone interested in working for state or federal government agencies or corporate human resources departments. Although specific classes may differ between schools, many programs share similar coursework. The list below describes a few courses typically taken by students pursuing a master of legal studies online degree. Introduction to U.S. Law: This course introduces students to U.S. legislative and legal processes. It covers legislative history, contemporary legal concepts, and the ways in which the law can be enacted and changed. Students gain an understanding of U.S. legal institutions, their roles and functions, and solutions for legal problems in these structures. Civil Procedure: This course introduces learners to the litigation process in civil proceedings, including procedural posture, the sequence of events in pre-trial and trial practice, and standards of appellate review. Students gain the skills necessary to read and analyze judicial rulings and other court documents. Corporate Compliance: This course examines the landscape of corporate law-breaking, incentives for corporate compliance, and the legal repercussions of compliance failure. Seminars focus on case studies of recent incidents of corporate compliance failure, prompting discussions about company-level misconduct, the efficacy of relevant laws, and theories of regulatory enforcement and punishment. Employment Law: This course introduces students to U.S. laws and regulations regarding hiring and firing, employment type, minimum wages, hours and benefits requirements, prohibited discriminatory practices, and other standardized processes and procedures. Students gain a comprehensive understanding of legal theory and learn to apply this knowledge in practical employment situations. Property Law: This course introduces the principles of property use and how U.S. law regulates property. Concepts covered include real and personal property, landlord and tenant law, easements and principles of property law, future interests, and the estate concept. Students gain the skills needed to discuss and analyze legal property disputes. How Long Does It Take to Get an Online Master’s in Legal Studies? A master of legal studies online degree generally requires 24-32 credits of coursework and takes 12-16 months of full-time study to complete. However, program length may vary based on curriculum requirements, student enrollment status (i.e., part-time or full-time attendance), and course schedule and pacing. Each program imposes its own requirements regarding courses, theses, and capstone projects. Schools may also operate on different schedules. For instance, many online master’s programs offer accelerated course schedules with 6-8-week sessions, allowing students to expedite their graduation timeline. Individually paced classes give students a certain amount of time to complete course assignments on their own, while cohort-based classes synchronize all deadlines for a group of students who move through the program in lock-step. Paralegal Certification: Some of the best online master’s degree in legal studies programs prepare graduates for paralegal certification exams from the National Association of Legal Assistants and the National Federation of Paralegal Associations. Healthcare Compliance: Companies that deal with compliance issues often require specialized certification in healthcare compliance. Accredited by the Compliance Certification Board, this certification requires about 15 credits of classroom time plus work experience. MLS programs with healthcare concentrations should cover these requirements. Institutional accreditation provides quality assurance to students regarding their education. In the U.S., two types of institutional accreditation exist: regional and national. Regional accreditation is generally perceived as more prestigious and standardized, and credits transfer more easily between regionally accredited institutions and programs. Several regional accrediting agencies operate in the U.S., each serving a specific geographic area. The regional accrediting agency charged with accrediting your program of interest depends on the institution's location. National accrediting agencies also evaluate academic quality based on a set of standards, although this designation is usually earned by vocational or for-profit schools. Other organizations also play roles in the accreditation process. For example, the Department of Education (ED) provides oversight of accrediting agencies to ensure they effectively enforce quality standards. The Council for Higher Education Accreditation (CHEA) also reviews the quality of accrediting agencies. The ED and CHEA provide databases of accredited programs on their websites. Several factors can influence a professional's salary level, including their employer, position, geographic location, and experience. Starting salaries often depend primarily on an individual's previous work experience and/or educational attainment. Those with more advanced degrees may qualify for higher starting salaries. As with most fields, legal studies professionals tend to earn more as they gain field experience. Legal studies professionals can expect a $13,000-$25,000 increase in their annual salary over the course of 20 years, as demonstrated by the table below. Professional experience level significantly impacts the annual salaries of employees in legal studies. The table below features data from PayScale regarding expected salaries for compliance officers, paralegals, law clerks, operations managers, and human resources managers at various stages of their respective careers. A master of legal studies program teaches students skills that can be applied across a variety of industries, including law and the legal system. In fact, most legal studies programs serve professionals aiming to gain a deeper understanding of the legal system to improve their ability to perform their jobs, often in operations management or human resources. Paralegals and legal assistants aid lawyers with their day-to-day tasks, including organizing files, carrying out legal research, and drafting legal documents. They also help lawyers prepare for trials, hearings, and corporate meetings. Paralegals should be detail-oriented and possess strong organizational skills. Human resource managers typically liaise between managers and higher-level executives and employees. They hire new staff, oversee employee benefit programs, and handle staffing issues. They may also strategize with executives to optimize employee productivity. Human resource managers should possess strong communication and interpersonal skills. Judicial law clerks handle administrative and clerical tasks for judges, such as conducting research, drafting court documents, and attending court sessions. They also administer oaths to swear in juries. These clerks typically work in courthouses and should be well-organized. Compliance officers examine and evaluate an organization's or individual’s conformity to laws and contracts, such as licensing and purchasing agreements. A company’s compliance officer ensures that the company follows outside regulatory requirements and adheres to internal policies. These professionals may also conduct enforcement inspections or analyses. Professional organizations in legal studies provide students with networking opportunities, continuing education programs, and career services and job hunting assistance. Many professional organizations host annual conferences and publish resources about the latest innovations in the field. Joining a professional organization can help graduates of online master’s degrees in legal studies meet other workers in the field. National Association of Legal Assistants: NALA assists paralegals and legal assistants by providing continuing education and other professional development opportunities. It offers professional certification programs, occupational reports, and publications and seminars to help legal professionals succeed in the workplace. It also provides career services and job postings on its website. National Association of Police Organizations: NAPO -- a consortium of police organizations -- promotes the advancement of U.S. police officers through advocacy, education, and political action. It also hosts a series of networking events to honor excellence in law enforcement. Society for Human Resource Management:: SHRM serves individuals working in human resources, providing research trends, human resource news, public policy updates, continuing education programs, certifications, conferences and symposiums, and career services. It also hosts resources related to a variety of human resource topics, such as diversity and inclusion, benefits and compensation, labor relations, and risk management. Students can help finance a legal studies master’s degree through federal and private aid. Federal aid usually takes the form of grants, loans, and/or work-study programs. Other organizations, such as businesses, nonprofits, local government agencies, and institutions of higher education, may also offer scholarships. Students can even find sources of funding that specifically target legal studies. Individuals should start by completing the Free Application for Federal Student Aid (FAFSA) to determine what types of federal aid they qualify for. Approximately two-thirds of today’s college students rely on loans to fund their education, but plenty of overlooked financing options can help reduce your overall student debt. Completing the FAFSA represents a crucial first step for any student with financial needs. Our FAFSA guide features a step-by-step rundown on the process, plus answers to frequently asked questions. Financial aid for online learning is equivalent to what you’ll find for campus-based learning, but that hasn’t always been the case. Learn about the changes that have taken place and the different funding opportunities available to online students. Online college programs provide a flexible, affordable option for single parents interested in earning a degree and securing their family's financial future. We've compiled a list of scholarships, grants, and other financial aid options geared toward single moms and dads.